Toddler Party Ideas: Need Some Kids Christmas Party Ideas? Toddler Party Ideas: A selection of crafts, recipes and ideas for Kids Chrismtas Parties. Here is a selection of ideas from our website that would make any Christmas party a memorable one. 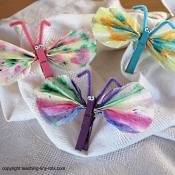 Easy kids craft....perfect make and take for Christmas parties! Pretty gift or decoration for Christmas. A project that can be tailored to any holiday or occasion. An easy gingerbread house with graham crackers that would be a fun activity if you have adults to assist. Will take some prep to make the activity go smoothly! 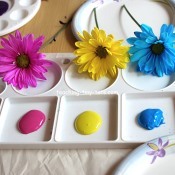 Easy make and take activity. Pre make the bows or buy the premade Christmas ones. 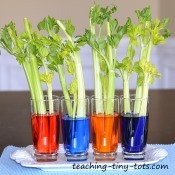 If you have helpers, this is a cute make and take activity. For young children, prefill the cocoa bags and secure. Have each child decorate their own goody bag using Christmas stamps and fabric paint. These tote bags can be found in bulk packs at most craft stores. They come in a variety of sizes and colors. Great kids party snack. 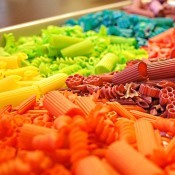 Colorful and easy to make. Great make ahead gift idea treat. Refrigerate until use. Also makes a festive centerpiece. Fast and easy to make! Send home a cute Christmas cookie cutter with each child...and a sweet treat inside!! Chocolate Bark with Fruit, Candies or Sprinkles Add dried fruit, small candies or sprinkles to make this festive treat! Great for kids parties or small gifts. Easy and so delicious! Great party snack...omit the nuts for small children and add mini Christmas M and M's or small chocolate coated candies. Mini Play Dough They are about 2 inches across and 1 inch high. At certain Dollar Stores, you can find many toddler party ideas. We really like the Dollar Tree which are found throughout out the US. -Play Christmas Carols, tie red and green balloons to the chairs to make it festive.